Dee had been adopted and was only hours away from going to her new home when she was killed. AMERICAN FALLS, Idaho (KIFI/KIDK) – A local ranch owner is looking for some answers after finding one of her mustangs stabbed to death. It happened Sunday morning on Fish Hatchery Road in American Falls. “A Little Piece of Heaven” ranch in American Falls said around 2:30 a.m. Sunday morning, one of their mustangs was stabbed to death. “Around 2:30 the dogs were going crazy and we just thought it was coyotes and we came out and one of the mustangs was out here, Dee, laying in the field,” said Erin McGuire, whose mother Kimberly Clark, owns the ranch. Dee was about 5 or 6 years old and was pregnant. She was due to have her baby in about a month. When Dee was found, she had bled to death from what appeared to be two different stab wounds. Dee was first stabbed near the fenceline that runs along a public access road. Dee then ran to the middle of the field where she ended up with a second stab wound, this time in the head. “A Little Piece of Heaven” ranch is a temporary home for rescued horses. It works with the group “Miracle Mustangs” who saves dying horses and those would otherwise be sent to slaughter. The ranch is one place horses are sent to and cared for until they can be adopted to permanent homes. The ranch said she was a great horse and they already miss her a lot. The ranch reported the incident to the Power County Sheriff’s Office, who is currently investigating it. Clark wants to encourage anyone who may know something to call the sheriff’s office and let them know. A Go Fund Me account has been set up to raise money for a reward to catch whoever is responsible. Around 5 p.m. Monday afternoon, a veterinarian and police took another look at the horse. They said Dee’s nasal cavity was completely shattered. They believe that injury occurred first, and then wound in her side occurred second. The vet said it’s possible the wound in Dee’s side could have come from a branch as she ran, but it could also still be a stab wound. He said the nose wound is unexplainable, and believes someone did it. Clark said police aren’t ruling anything out at this point and they told her they won’t have conclusive results for about a month. If you have any information you think could help with the investigation, call the Power County Sheriff’s Office at 208-226-2311. Its time for big time prosecution for those killing these Wild horses. There are some very sick people out there. Is it any wonder they don’t trust humans. So sad. Too bad she didn’t kick their brains in! I wonder if it is a group of people doing this. One of Madeline Pickens horses was killed just the other day too. Very very.sick people. 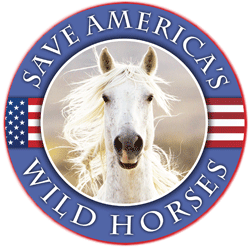 It wouldn’t surprise me if there are a group of people that go online to some private chat room or something and make arrangements to commit crimes including crimes against our Mustangs and burros. Someone should do what the guys on the TV show To Catch a Predator do: have private investigators go on these chat rooms and/or social networking sites, meet up with these thugs and have them incarcerated by law enforcement. Terror tactics will not work. I hope sanctuaries will up their security if they can. Otherwise, the Old West shotgun for trespassers ‘is legal’ according to trophy hunters. or I should say ‘it’s legal’ is the trophy hunters’ reasoning. How horrible. I still can’t get over this. It says her nasal cavity was completely crushed, which means she was hit very hard with a blunt object. I can’t imagine the mind of the monster who would plan and carry out something like this. And still, the behavior is excused by saying her stab wound could have been caused by a branch. Just the look of the wound alone would say otherwise I would imagine, even for someone with no forensic experience. I don’t know that this monster will ever be caught, but may he get what he deserves one day. As I said, I hope the sanctuaries will be on watch and hire security if they can. Ugh. Just imagine the karmic disturbance and the violence done to this poor innocent horse – it appears they shot her, or tried to, and botched it? Were they trying to slaughter her for meat? These monsters make my skin crawl. The othr stories are beyond belief as well – humans made in the image of God, I think not. May this monster or monsters get what they deserve, and the rest of us will sleep well at night knowing the world is a safer place, rid of them. It is legal to protect what belongs to you with what means necessary. The rescue that I donate to when I can was where this mare started out. This couple works so very hard to take as many horses as they can from the shipping pens & this mare was one of them. They do such good work – finding homes for these horses – to have this happen to one of them when they knew she was going to a good home has to just break their hearts. Where do these monsters come from? RENO, NV – It’s a crime that shocked the community and led to death threats for the defendant and his attorney. Thursday October 1, 2015, 25-year-old Jason Brown was sentenced to 28 years in prison for the torture and killing of seven dogs in 2014. This sort of abuse to animals must stop. I can only imagine what sort of behavior this person has done toward people. Someone committing such an awful offence toward animals are likely to harm vulnerable people as well. I hope greater security and surveillance can be arranged to keep this from happening in the future. Still prison sentences may help.